Footnotes | March/April 2013 Issue | What Do We Know about Postdoctorates in Sociology? Higher education has seen many changes that affect newly minted PhDs. These include the constriction of the academic job market, the increased number of publications required for tenure, the effort to shorten the years to PhD (or end what City College of New York President William P. Kelley alarmingly refers to as the “roach motel” view of doctoral completion). These changes may result in an increased de­sire for specialized training beyond the PhD and additional time to become more competitive in the job market. 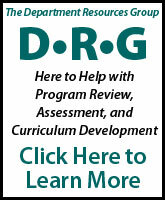 A postdoctoral position is one method of gaining additional specialized training. The postdoc is a well-institutionalized stage in the natural and physical science pipeline. In sociology, a field that has not traditionally used the postdoc as a stage in the career trajectory, there is increasing interest in the role of post­doctoral training in the discipline. What do we know about the kind of postdocs available to sociologists? Do they prepare new PhDs for cutting-edge specialties, prepare them for teaching, or otherwise help them continue their training in sociology? Each year, the ASA Research Department collects data from the ASA Job Bank, which include a listing and a description of all positions advertised. One type of advertisement is for postdoctoral positions. 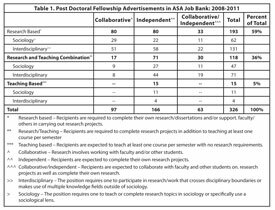 Compared with the number of teaching positions advertised for assistant professors in the four years between 2008-09 and 2011-12, there were relatively few postdocs (1,730 vs. 326, respectively), further suggesting that the postdoc does not appear to be an institutionalized stage in the sociology pipeline. There was, however, a slow but steady increase in postdoc advertisements over this four-year period. Based on a content analysis of the 326 postdoc adver­tisements between 2008-2009 and 2011-2012, we divided them into several types. The first was whether the position was research oriented, a combination of research and teaching, or primarily geared towards teaching. A second was between advertisements for postdocs for sociology projects and postdocs for in­terdisciplinary projects. The latter type of advertisement may have expressed interest in a sociology specialist for an interdisciplinary project or it may have expressed interest in a range of disciplinary areas, with no guarantee that a sociologist would have been hired. Finally, a third distinction was whether the position was to be performed individu­ally or collaboratively (see Table 1 for the number of postdoc positions advertised by type). Not all of the decisions regarding how to label positions were crystal clear—especially those that advertised teaching-focused postdocs. Table 1 shows 193 (or 59 percent) of these positions were research-oriented. An additional 118 (36 percent) were a combination of research and teaching positions, with the remaining 5 percent focusing on teaching. Equal numbers of positions were collaborative versus in­dependent, with fewer than half as many described as a combination of both (80 positions and 33, respectively). In general, the number of interdisciplinary positions, regardless of type of work, is substantially higher than the number of sociology positions (64 percent versus 36 percent of all posi­tions). All told, the largest category of position was research based and interdisciplinary to be conducted collaboratively, independently, or a combination of both. According to the ASA Job Bank data, it appears as if the demand was more likely to be for postdocs who would do interdisciplinary work rather than sociology alone. We do not know whether these positions were to work on a faculty member’s research (as they frequently are in the natural sciences), substitutes for adjunct or full-time faculty, or for training positions. We also do not know if sociology departments are preparing PhD students for interdisciplinary work. Future research on this topic will examine whether those who have held postdocs are more successful in achieving professional goals such as publications, grant receipt, tenure, and promotion than those who did not obtain these positions. Or does participation in a postdoc program lengthen the time to tenure, without other visible rewards?